A 28-year old scientist is at the forefront of research and development of robotic systems in the Russian Far East since 2007, and specializes in projects involving developing robots with a marine application. Every morning, 28-year-old Sergei Mun attends briefings, meetings and at first glance seems like a normal office worker in the Russian Far Eastern city of Vladivostok. Only one thing differentiates him: He knows how to make robots. Mun first became interested in the realm of artificial intellect in his fourth year at university. The field is one in which few people in the city specialize in. All the courses Mun took dealt with underwater development and in 2007 he started studying technological sight systems for underwater robots. The following year he was already heading a team of students from two Far East universities that participated in the international Marine Advanced Technology ROV Competition in the United States. About 600 teams from all over the world take part in this competition annually, representing the most prestigious international universities, such as the Hong Kong University of Science and Technology and the Massachusetts Institute of Technology. In 2010 Mun's team came first in this battle of the science titans, in which competing teams had to "prepare, create and develop their own underwater robot, with a size of 50 x 60 x 70, that is, the size of an old television," the scientist told RIR. The 2010 win was the Russian team's first victory, and in 2012 they went on to become champions again. “There are not that many teams that have won the competition more than once," said Mun. Vladivostok is pervaded by the spirit of adventure and adventurism, and of course, by underwater subjects. So there is nothing strange about the fact that the field of robotics here is linked principally to the sea. A few years ago Mun began working at the Maritime State University of Vladivostok. Here he is in charge of a local student team and works on his own projects. "The university allots a great deal of attention to marine robots," said Mun. "Its priority is the establishment of northern sea routes. Without pilotless systems there's no way we can take on difficult meteorological conditions. Robots will be irreplaceable for geological development." Yet Mun’s work at the university is just an additional job. His main occupation is related to the Vladivostok Center of Robotic Development. The Center of Robotic Development was founded in 2013 when Mun met Dmitry Alexeyev, general director of Russia’s DNS digital stores network. Mun and Alexeyev decided to establish a new scientific center for the city's students where they could do exercises with builders, work on their own projects and prepare for competitions. 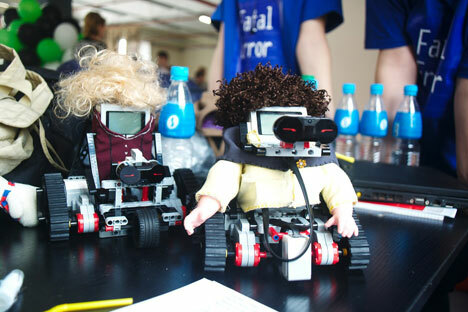 The Center has already organized the first RoboFest for the students of the Primorye Territory. The next festival is scheduled in Vladivostok for November-December 2014. Every year Vladivostok hosts a series of sailing events. Mun and his colleagues from the Center of Robotic Development have decided to organize a competition of robotic sailboats for children and students in the beginning of the fall. The teams will have to construct a wind-powered sailboat that will be energy-efficient. Mun always encourages creativity and the rational use of improvised material. The participating teams can robotize the boats in order to carry out their assignments. The boat can be remote-controlled or a computer can be placed on it to transmit data onto the shore and make decisions. Mun urges his students to think strategically and employ the principles of economic efficiency when constructing robots. Points are deducted from the students or every additional 1,000 roubles ($28) spent. This is how Mun encourages creativity. "We can invent and create good things in Russia, but this costs us lots of money, strength, time, and human resources, and it will be done without any efficiency,” he said. In May 2015 Vladivostok will host several regional competitions on underwater robotics as a preparatory phase for international competitions. The competitions will include university and high school student teams from Russia and Asian countries. Why do we need robots? Mun is not a fervent advocate of universal automation and utopian ideas about a universal robotic future. "I like to develop personalities, that is why I teach," he says. "Robotics for me is a means of personal development and a method for the integral understanding of the technological sciences. It is impossible to create new technology without software now. Maybe an iron can be made without software, but a new car can't." "I think there are a few motives for working with robotics," Mun's colleague Angelina Borovskaya told RIR. "First of all, it is good for the individual, for the development of systematic thinking, for teamwork skills and so on. Secondly, even though I don’t see much development in robotics in Russia, I don't dismiss the importance of robotics for science and industry in general. Thirdly, it's just very interesting; you always learn something new." Denis Mikhailov, scientific collaborator at the Russian Academy of Sciences and an expert on navigation systems and sensorial information processing, is more optimistic: "Currently in the Primorsky Territory there is a lot of intensive development in underwater robotics. In the future I can see prospects for the development of aviation, industrial, common and other types of robotics. The only thing that may stand in the way is the absence of experts in this field." Mikhailov believes that Mun is trying to solve this problem. "More and more young students are becoming interested in robots. I think that technologies that can be developed on study robots will find wide application in the future."